With the Centers For Disease Control and Prevention (CDC) and cancer.org‘s cancer estimation of the approximately 1 665 000 current US cancer case rates (data collected for 2011 & estimated rates for 2014) , it’s no doubt people are seeking to become more informed regarding how to prevent, fight, treat, and avoid cancer over the course of a lifetime. Despite what the title of this blog alludes to, we are not talking about hydrotherapy or drawing a hot relaxing bath (yet beneficial in many health regards as well!). 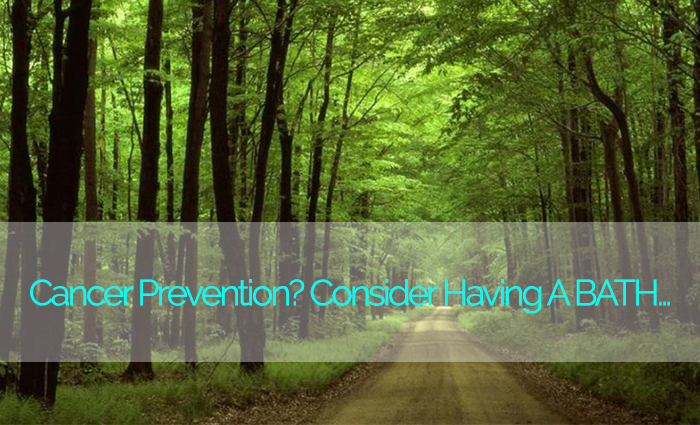 Rather, we are referring to what science and literature are confirming to be beneficial and potentially helpful in the quest toward cancer prevention as well as an important lifestyle component of an anti-cancer approach, a term coined and referred to by Japanese researchers, as Forest Bathing. Forest Bathing…How Does It Work? Ok, lets break this down in simple terms… Forest Bathing simply refers to spending time in and amongst the trees, forests and nature. So to take a forest bath means to take a walk in nature! Now a word about natural killer cells (NK cells). NK cells are leaderswithin the immune system for their ability to specifically kill tumor cells. NK cells can recognize and destroy cancerous cells without harming healthy tissue or other cells. This is well established in science as a prime mechanism of how a healthy immune system initiates an instrumental first line of defence against the initiation and growth of cancer. Forest bathing has been shown to increase NK cell activity as well as increase the actual number of NK cells. How? A forest bathing trip consists of time (unknowingly) breathing in volatile substances (called phytoncides), which are antimicrobial and volatile organic compounds found to be naturally released from trees, bushes and brush (such as a-pinene and limonene). I’m sure everyone can recall the fresh scent of a pine, or naturally fresh smell of bark and/or a plants leaves? It is in fact, the volatile compounds I am speaking of that you’re inhaling! Now isn’t that something! Details of the research, which you can read here and here, describes the above results. Not only did the research present the above positive results, it also found that not only does forest bathingimprove the NK cell panel, it also found these benefits lasted for more than 7 days….AND…stress hormones were measured to be decreased as well! So what are you waiting for? Include forest bathing (20min+ per day as often as you can) into your anti-cancer arsenal…get out of the city and out into nature today!